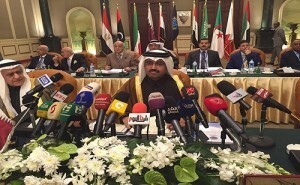 The State of Qatar chaired the 95th ministerial meeting of the Organization of Arab Petroleum Exporting Countries (OAPEC), which was held in Cairo today. HE the Minister of Energy and Industry Dr. Mohamed bin Saleh Al Sada chaired the meeting during which the latest developments of the global oil markets were discussed. According to a press release issued by the Ministry of Energy and Industry, Dr. Al Sada appealed to member countries to upgrade the level of coordination among them and to raise productivity during oil exploration and extraction processes without prejudice to the environment’s safety. OAPEC ministerial council also discussed a host of issues tabled on the agenda, foremost of which were the estimated budget of the year 2016 and was also briefed on a report on the latest developments of climate change, participation of the general secretariat in Arab, regional and international activities, and the outcome of the scientific researches and studies OAPEC had conducted. The State of Qatar is the chair of OAPEC current session. The ministerial meeting was preceded by 143rd meeting of OAPEC ministerial council held under the chairmanship of the Representative of the State of Qatar at OAPEC Executive Council HE Sheikh Mishaal bin Jabor Al Thani.